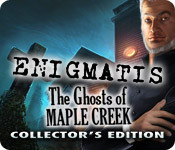 Enigmatis: The Ghosts of Maple Creek Collector's Edition is rated 4.4 out of 5 by 70. Rated 5 out of 5 by megwoman25 from Review Of Completed Game... A Classic! So I just finished playing this game for the second time. I rarely replay games so you know this one has to be a favorite of mine. This time around however I played the collector's edition so I got to see the bonus game. I have to say that the bonus game was really short and although it explained the past to you, it really wasn't very riveting. I understood the past enough through the main game so the recap wasn't necessary. However, I played this game again to remember the story-line because this series is a trilogy and the final installment was released a few months ago and since I love this series, I thought a little refresher was in order to play the last game. Mists of Ravenwood is up next. But I digress. Let's keep in mind that this game is from 2011, therefore the extras we see in many games are sorely lacking in this one but all is forgiven since it was made ages ago. So what's missing you may ask? There is a map but it is NOT transportable. However, the layout of this game is easy to remember and so even though there was a lot of back and forth, I didn't find it to be treacherous like in some other games. The hint button helps steer you the right way as well. The game only has 2 modes of difficulty. Easy & Hard. Even though sparkles are removed from the whole screen on hard, you still get them on hidden object scenes. 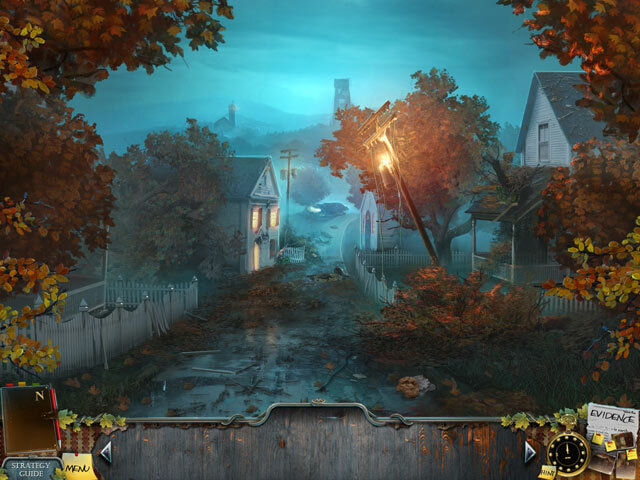 The hidden object scenes in the beginning have a few interactive bits but as the game progresses, that bit goes away and there are only straight lists. Each scene is visited 2-3 times but I was never asked to find the same item twice. Not only that, the items are actually hidden so even though I would usually find this overkill, I actually liked the scenes since it was a true hunt to find the items. The inventory bar does not lock (my pet peeve...oh well) and you can't get rid of black bar tips although its mainly just your avatar talking about her findings so its not really a step by step guide. There are also no collectibles, morphs or achievements but I have to say I kind of liked the fact it was bare. I had more time to follow the story without having to look for random dolphins or swirls. I could also use the hint in the hidden object scene without fear I'd lose the achievement for no hints used all game. My favorite part of this game is the journal. Let's be honest here. I rarely use the notebook in games. I may go see a code that was written down but usually I find them quite boring to go re-read everything that was in movie form. BUT this game takes the journal aspect and makes it completely awesome. In your hotel room, you have an evidence board. 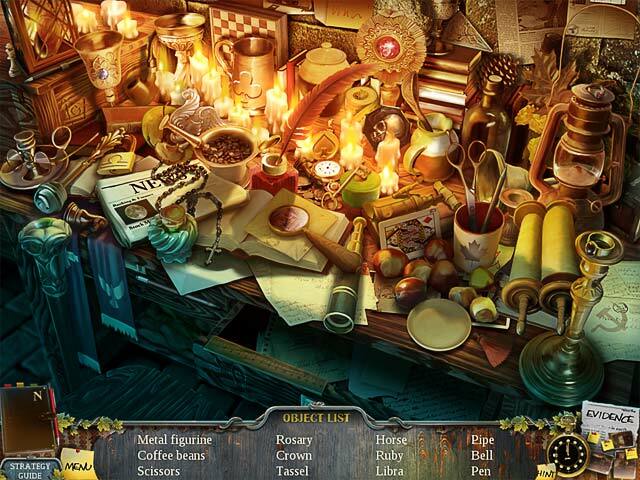 You find various notes, pictures and clues and put them on the board in order to solve the crime. You use a mapping technique to figure out how who the suspects are, where the crime happened etc. Whenever your avatar lady figures something out, the journal pops up and its like you are writing yourself. There is a pen writing noise and while she writes it out, she reads it aloud. You are given insight into where the case is going. I remember when this game first came out, I thought this was the most genius approach ever! Strangely not many developers copied it like they copy everything else. But this feature is what gives the game depth because its a brand new element and its very well done. I loved actually solving the crime. It feels like a detective cop show with the evidence board. Kudos to the developers for such a winning idea. The puzzles in this game were a bit tricky but doable. Some were easy but others required some thought. There was a typewriter one I couldn't figure out. Blonde moment maybe? I liked the tricky puzzles because the games now have such easy puzzles its insulting. There are also creative puzzles in this game. I never had to do a pipe puzzle for instance. I also never had to open any zippers with a paperclip. I never had to search for a butterfly. I like the creativity put into this game. I wish more games had creativity like this. This game also has an awesome soundtrack. It made the game eerie, spooky and set the stage perfectly for a dreary town with an evil entity. The way this game starts is unique and I liked having her flashback to what she remembers the more she searches "I remember now...". There are many twists and turns in this game along with lots of hidden areas to explore. The plot is great and keeps going into the other games in this series hence why I needed a refresher. Its also a long game. Even though I already played this game in 2011, it still took me about 6+ hours to play it. The bonus game only adds about 25 minutes but the main game is a gem that is still fantastic even 5 years later. I can honestly say that this game ranks in my top 10 favorite hidden object games ever. It blew me away then and still tickles my fancy now. This developer always amazes me with their creative new takes on a now old genre. I can't wait to wrap up the trilogy and find out what happens. I can say the 2nd one in this series, Mists Of Ravenwood was just as riveting and I enjoyed it very much. I definitely recommend not only this game but the series. Its so rare that sequels live up to the standards of the first game and this is one of them. This developer also did Nightmares From The Deep series which I completely recommend as well. Loved playing this game again. Cheers developers! You are one of my all time favorites!! Rated 5 out of 5 by Gamer9374 from Help her remember the past! Very good game. Excellent visuals and story. There is a new feature introduced in this game that is the evidence. Rated 5 out of 5 by julie500 from oldie but a goodie I bought the other ENIGMATIS games and read the reviews that this one was the best.so I bought this one.Very pleased I did,the reviewers were not wrong,this is a good game.it seems you have to buy older games nowadays! Rated 5 out of 5 by smoovasbutter from Possibly the best HOG I ever played Excellent movie like story. The best HOGs are the ones with the best story. Very creepy, very Silence of the Lambs-esque. The graphics look like brush painted and aren't the most detailed I have ever seen but do a good job of creating the creepy atmosphere and ambiance. Good music too. Great job from Artifex Mundi. 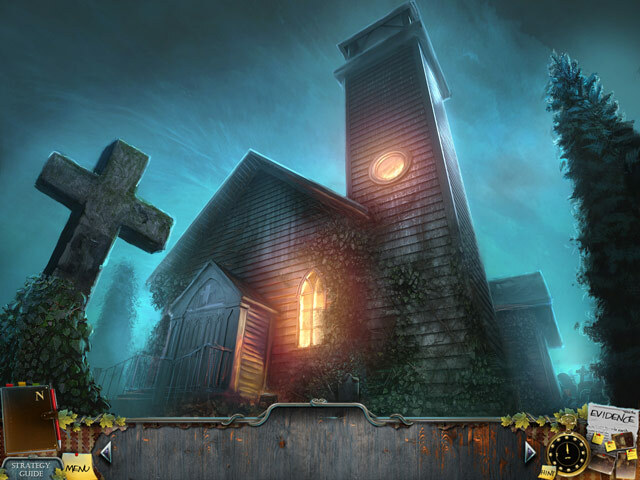 Rated 5 out of 5 by pennmom36 from Enigmatis: The Ghosts of Maple Creek CE I'm a big fan of the second edition of Enigmatis, The Mists of Ravenwood, but for whatever reason, I never made it past the demo hour with this game. Long story short, I bought this game, the demo just doesn't serve this game justice, it's fantastic. You were investigating the case of a missing girl in the sleepy little town of Maple Creek, when a tornado rips through the town. Thank goodness you're unharmed, but your memory is still fuzzy, leaving you no choice but to piece the evidence back together, and the evidence is staggering. Turns out there have been multiple missing persons reports dating back over the past 80 years! You've got your work cut out for you on this investigation, can you solve the case of all of these missing people, detective? As you re-collect the evidence the tornado has spewn about Maple Creek, you will use your Motel wall as a makeshift Evidence Board. After sorting through the paperwork, and placing the collected evidence in the correct spots, you will be able to make a deduction about that particular scenario, and eventually solve the case. There aren't a lot of frills with this game, but for an older game, the graphics are decent and doesn't seem "dated" like some games you re-visit. The Hidden Object Scenes are all Listed word finds, with slight interactions where you click on an item to open it up, which exposes the object needed. All of the HO scenes are repeated once, which is a feature I really don't like because the items are too easy to find a second time around and it's boring. The Mini Games are fun, mostly comprised of puzzle tikes, swapping tiles or rotating tiles to complete a picture. This Collectors Edition has Concept Art, Wallpapers, re-playable Hidden Object Scenes, Videos, a built in Strategy Guide and a Bonus Adventure, enjoy! Rated 5 out of 5 by kevsters from I have only one regret This franchise is the reason that I've fallen in love with Point and Click adventures. My only regret is that I found out that this title comes before Mists of Ravenwood after playing Mists first. Rated 5 out of 5 by StellaEterna from Phenomenal! Artifex Mundi develops some of the best HOGs and I absolutely loved playing this one. Rated 5 out of 5 by AngelQueen36 from Creepy is fun I don't know why this game is not in the Top List. It's very very worth the money especially the CE. Wonderful storyline, easy to find HOG, just enough spookiness and down right AWESOME fun.